Our move from Saskatchewan to the Chicago area is finally over. And one of the perks of living near a major city is that I now have greater access to spices of the world. Za’atar is one of my favorite discoveries ever when it comes to spice blends. I bless the day that my dear friend who lived in Jordan introduced me to such a glorious blend of thyme, sumac, and sesame seeds. Za’atar is unique and versatile enough to go on anything from chicken to bread to eggs. I have already packed these delicious eggs for my daughter’s school lunch (which she thoroughly enjoyed). 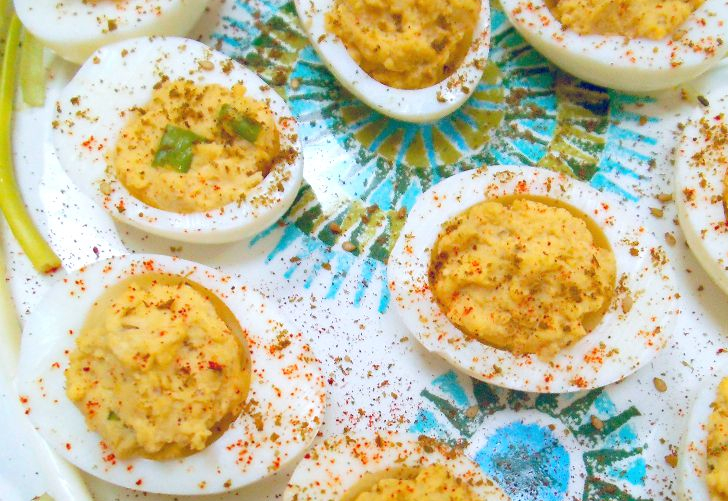 Next, I am planning to serve a platter of these deviled eggs over Labor Day weekend. The perfect blend of spices makes the eggs taste exotic without overpowering their classic appeal. My family really enjoys them, and I am confident this updated potluck classic will be a hit with the relatives too. Slice cooled eggs in half lengthwise. Gently remove yolks and mash with a fork in a medium bowl. Add mayonnaise, lemon juice, and za’tar and blend briskly until smooth. Add sea salt to taste. Stir in green onions, if using, until well incorporated. Use a small spoon (or plastic bag with a corner snipped) to place portions of egg yolk mixture into hollow egg whites. Sprinkle filled eggs with za’atar and paprika. Cover and chill until ready to serve. *The Ziyad brand, which I bought, uses wheat in the blend. You can blend your own to make it gluten-free, like this homemade za’atar recipe. Fiesta Friday and other fun parties here. Thanks, Kelly! I’m so happy to have gotten a big bag of it to play with! Hope you can find some out west! Soooo I’m going to have to find some of this za’atar and put it in everything! It sounds really delicious. 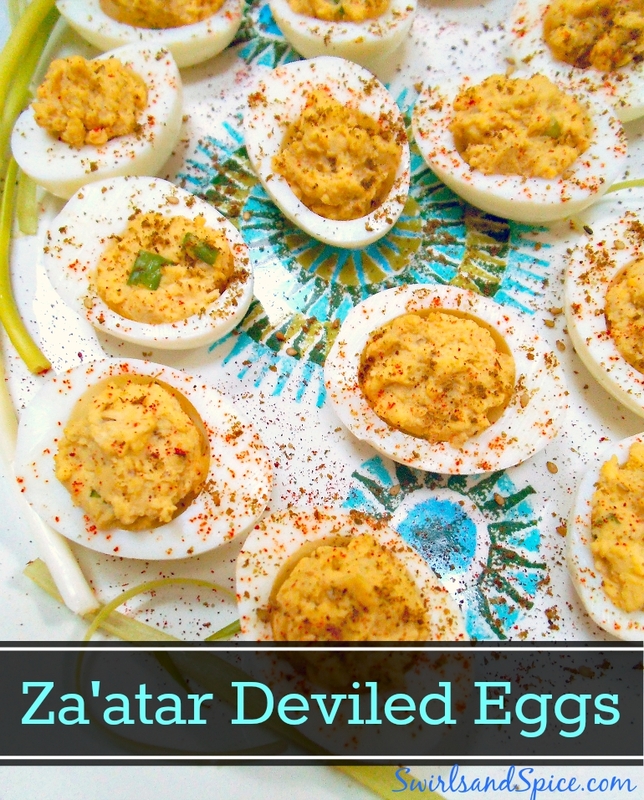 Devilled eggs tend to be a lot of the same, so it’s great to see a new twist! Yes, you definitely need to try za’atar! It’s so good! Perfect timing! I’m making deviled eggs for Labor Day. I was just going to use my regular recipe, the one calling for sweet relish, but your version with za’atar sounds so much more appealing! It’s time to change the old classic up a bit. Thanks for this, Julia. And congratulations on the move. Chicago is an exciting city! I am also in love wit Za’atar. It’s such fun to explore the flavors of other cuisines. I just made my own za’atar!! This sounds yummy. I wish I could taste it! Every za’atar recipe is a little different. Did you use oregano or thyme? I don’t have ant Za’atar but do have some Sumac that I could try this with! Yes, you could make your own spice blend with sumac and thyme or oregano. Another commenter here did just that!